When I first thought about opening an Etsy shop I read what ever I could find written by seasoned, successful Etsy owners. One of the things I read repeatedly was to find your niche and stick to it. Don't mix crafts or merchandise. The problem with that is that I love to do so many things. My day four give away is all about memories. 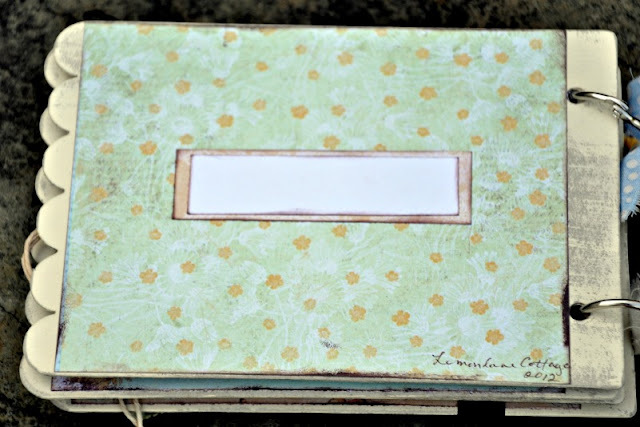 I have been making these special memory journals for my family for quite some time and I really wanted to share them with you. 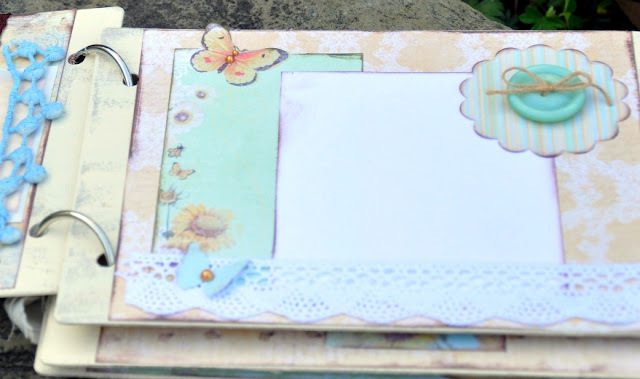 There are spaces to add photos and write memories on each page. I think they would make a nice wedding, birthday or shower gift for someone special. 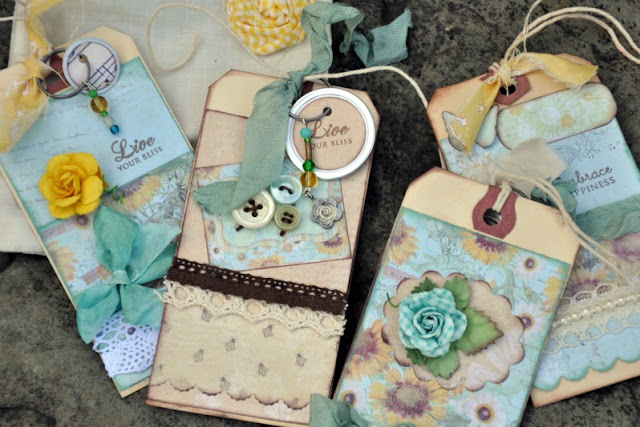 And speaking of gifts, I made up some pretty, embellished gift tags and a little pouch to store them in. Let me know...should I include them in the shop? Since today is all about memories and writing, I thought it would be fun to find out who remembers having a pen pal? For you youngsters, before email and facebook there was something called a pen pal. I had several during my tween years. I can't remember what magazine they were listed in but there were pages of names and addresses that you would pick from and write a letter and send a school picture to. Today's question...Did you have a pen pal? 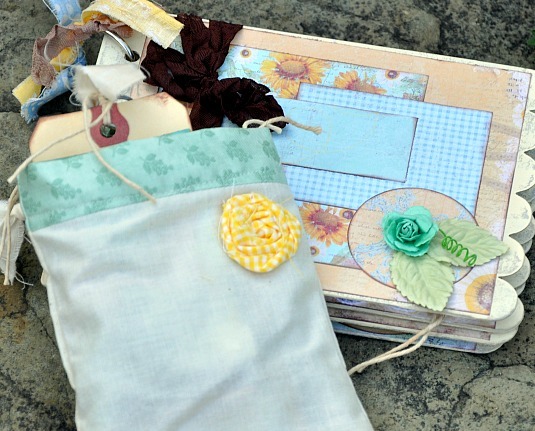 Just leave a comment on today's post for a chance to win this pretty memory journal and set of gift tags. I am looking forward to hearing your memories. Good morning! I think of my sweet blog friends as my pen pals and I adore their take on connection. Your little albums are fantastic! Art journal + scrapbook + love! Isn't Etsy fantastic? What an idea! I love the way so many can gather there and it reenforces the "everybody is everybody" way of thinking. It's like a world size market of creativity. Your memory books are sweet . . . I would put them on Etsy! I had a pen pal, in fact two . . . I enjoyed writing to them. They were each from England. In fact I have some of their letters tucked away in a scrapbook, inside a box, stored in one of the containers, in amongst other boxes . . . I am sure you get the picture . . .
Sweet memories of yesterday . . . I remember the waiting between letters . . . and the thrill of receiving a letter . . . somewhat like what I feel in receiving a blog comment. Love your album and tags! Yes, I'm still in touch with my pen pal from ages ago, though mostly only at Christmastime now. Was so happy to meet her and see her home in Wales back in the 1980s. Probably had more than one back when we started, but Lowri Ann's the one who's lasted. I did have a pen pal in 5th grade and we wrote back and forth for a while. She had great spelling and mine was always lacking. The little albums are cute! p.s. My sister and I are pen pals. I had a pen pal in 5th grade and she was from England. We lost touch in our twenties but I still remember her thoughtful letters and still have her old address. I guess that might be where my love affair with everything English began. Nope, no pen pal. I wish you great success with your etsy store! No, I didn't have a pen pal. You are so talented! Love your memory book and those tags. I didn't have a pen pal for I was a horrible speller and was to afraid. Now I know it would have been a good lesson in learning to spell better. This horrible spelling has followed me into adulthood and even gave me some jitters with starting my blog. But I am an expert with the dictionary and spell check. One thing they don't help is with my grammar. I DID have a pen pal! She lived in Washington State. I can't remember her name. Sad. BUT I loved having a pen pal! PUT the stuff in the shop. ALL of it. There are no rules in talent. I would definitely put them on Etsy! No, I never had a pen pal, but did write to friends I had made at summer church camp. Two of our daughters, on the other hand, did have pen pals for a short period of time. I have a pentagon of pen pals. The five of us catch up daily through e-mail~ a blessing over having to read what penmanship I have left. Sometimes it is just once a day~ but strength is in numbers~ so sometimes we bolster each other up more often. Love your memory books! Yes, I had a pen pal, her name was Molly and sadly we lost touch. I enjoyed writing to her and have thought about her and wondered where she was and what she was doing. Those are fun memories! Thanks for reminding me of them!! 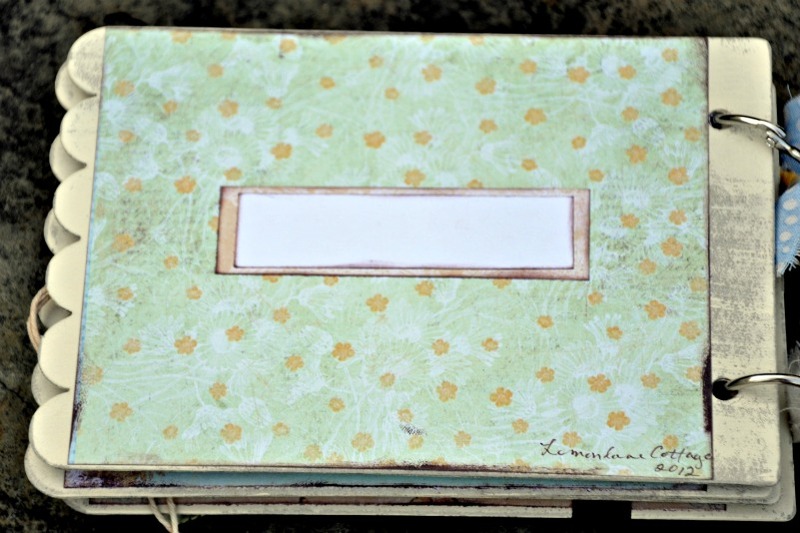 I love the memory book and tags. I had several pen pals. I always loved to write. Yes I did!!!! I forgot all about pen pals.. thanks for the trip down memory lane!!! Your memory book is beautiful and would make a very special gift. The tags are also beautiful. You have so many talents! I say, absolutely, put them in your Etsy shop. As for pen pals... I did have one in fourth grade. Our teacher organized it with students from another school. Her name was Kathy Pinkerton. I thought it was so exciting to receive a letter from her. First of all yes should should put these cute memory books on your etsy. They are just sooo cute. I had a pen Pal for years and I have often wondered what became of her. We would send little gifts back and fourth. So I was always looking forward to the mail. Thank you for another nice giveaway. They are lovely Patty. I especially like the tags. I do remember pen pals but do not remember having one. The tags and the little book are so sweet. Yes, you should include them. 'I had a pen pal when I was in school. Not sure how old - 11 maybe. Mine was from Japan. Her name was Yoko.....and she sent me a picture of her family. We wrote back and forth a few times over a couple years. It was fun getting those over seas letter. I had a pen pal when I was young and now I have one I love writing good, long letters to. My dog even has a "paw pal"
I had a French penpal when I was in 9th grade, 1962. I still have a beautiful scarf she sent me for Christmas. I don't remember much else other than the delicious chocolates filled with liquor that also arrived periodically. Umm. What a treat for a 14 year old in 1962 from a very small town in PA. I was thinking about those chocolates and forgot to mention your beautiful journals. Writing and posting pics would be fun in your journals. What a beautiful work of art you have made. Anyone would be honored to have something so pretty. 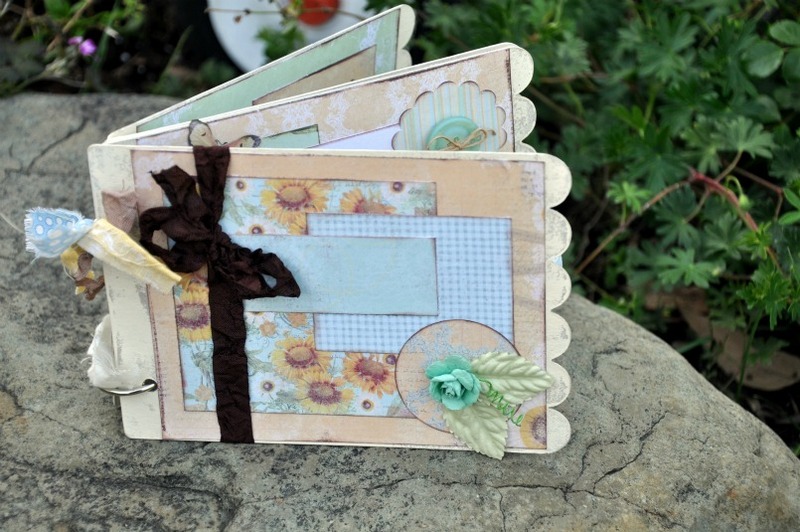 I love those tags and journals! I have a pretty wide mix of goodies in my shop and I have nevewr had trouble selling them. I think as long as you love to make something, someone will love it too! That memory journal is just beautiful. I would love to win it. Thank you for the chance. I had several pen pals. My last one was a soldier that my third graders wrote to in the 90's. I love your memory journal and your tags. They are just lovely! Wonderful giveaway. Thanks for hosting!!! I'm 43 and I still have penpals from all over th world, including Belgium, England and America, We write letters to each other and every now and again we send little gifts throught the mail. Its such good fun. I didn't have a pen pal but I loved to write letters and used to write to my Aunt who only lived a few hours away. Those letters are some of my treasures now. I think your album and tags are beautiful and will do great on Etsy. 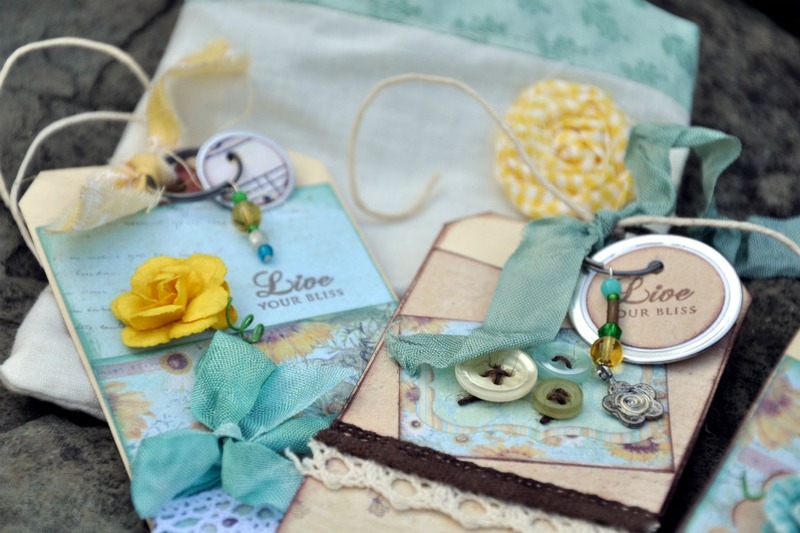 You must put your memory books on your Etsy site. They are darling! Yep.. I too had a pen pal. If I remember right, our teacher set up a pen pal exchange with another teacher in another state. It's been too, too many years ago for me to remember the details. Loved getting a letter in the mail though, and from another state. It seemed so exotic at the time ~~LOL. Yes, I sure did have a pen pal! She was from Australia! We had some really great letter writing! We were twelve years of age! What memories! Blessings, and by the way your Etsy wares are really nice! I've never had a pen pal...I think it would lovely to have one though! Your memory books are sweet. I love all the detail...yes, into your Etsy shop they should go!! I loved having a pen-pal way back in the 60's but unfortunately never got to meet her. Those are so cute and, yes, do the card tags! Oh, goodness, I remember the pen pal names and addresses in the back of the teen magazines. But it was something that I never tried. I wish I had though! i had several but one in particular i remember --- i don't know where i got this pen pal from, but he was joining the military & we were pen pals for just a few months. i don't remember his real name but he had legally changed his name to "salty pepper"---when he did that, it creeped me out & i never wrote to him again!!!!! The little scrapbook is darling. How fun to journal about a summer vacation in that little cutie. 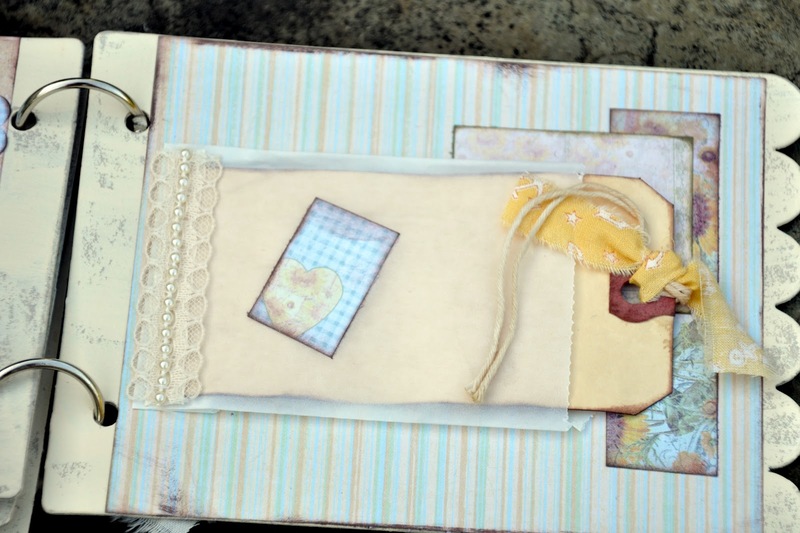 Your scrapbook is just adorable. Yes, I had a penpal back in the fifties. She was from Michigan. Can't recall her name but we wrote for about 2 years. I'm a new follower. Well, not exactly but I had a best friend that moved away and we wrote to each other for years. P.S. I think you should include all the things you love in your shop because your followers are all unique and like different things too. I'm like you, I have so many interests one could never satisfy me! LOL! Your memory books are adorable and would be appreciated by all that receive them. I have an e-pal friend and we have been emailing for many years now. I love these journals and gift tags! You should definitely put them on etsy. I certainly did have pen pals while I was growing up...in fact, when I was 16-17, I was writing to 75 people!